We Solve Water Problems . In 1932, long before the general public understood the importance of water conditioning equipment (or even its very existence), Diamond Water committed itself to develop and offer innovative, cost-effective products to remove impurities and deliver clear, pure, safe water. 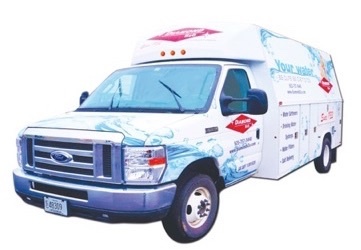 Our long history and experience in manufacturing, selling and servicing water conditioning and filtration equipment makes us uniquely positioned to add expertise and value to your home or business. We specialize in water softeners, conditioners, filtration systems and other products for residential, commercial, industrial and mixed water conditioning applications. We design and manufacture many of our products, and we can extensively customize and configure our equipment to nearly any need. We also carry drinking water systems, water heaters and various filters, chemicals and accessories for our systems. Our strong product line and industry knowledge is bolstered by our full service in-house lab, TG Analytical Laboratories, which allows us to provide a variety of water analysis services, including system recommendation, evaluation and performance testing. To further enhance our comprehensive manufacturing, sales and lab analysis services, Diamond Water’s service department, led by several licensed plumbers, ensures that everything runs smoothly for years to come.